Master the Art of style is an outlet to every thing rare, unique, and beautiful in the world of fashion. Without its artisans, haute couture will cease to survive. Since the initial start of haute couture and especially after the Second World War, haute couture has depended on the quality of its sources and the artisans that create the raw materials used in creating these special creations. Although, these artisans are kept from the spot light, they must be appreciated and celebrated for their respected craft! One house in particular, which I had the privilege to visit, is Hurel. Maison Hurel was incarnated in 1879 by Edmond Hurel as a embroidery house in Paris, France. Not until the 1940’s did Hurel included fabrics, or tissus, making the house known for Lace, Tulle, and its Novelty fabrics. The demand for novelty fabrics has grown among fashion houses, being its biggest service , and reserving embroideries mostly for haute couture. Maison Hurel has a very impressive clientele list, which includes Grande Maisons of haute couture, such as Chanel and Valentino. Other major houses include Saint Laurent, J. Mendel, Jason Wu, Gucci, Tom Ford, Christophe Josse, and Roberto Cavali to name a few. In 2007, Maison Hurel was taken over by Benjamine Hurel, Granddaughter of the house’s founder Edmond Hurel. The 5th generation Hurel family is taking the company to a new direction, to usher the house in to a modern era without losing the integrity of the Metier d’art. Madame Benjamine Hurel discussed how they are involved with reviving old techniques of fabric making and applying them to new, modern, designs. 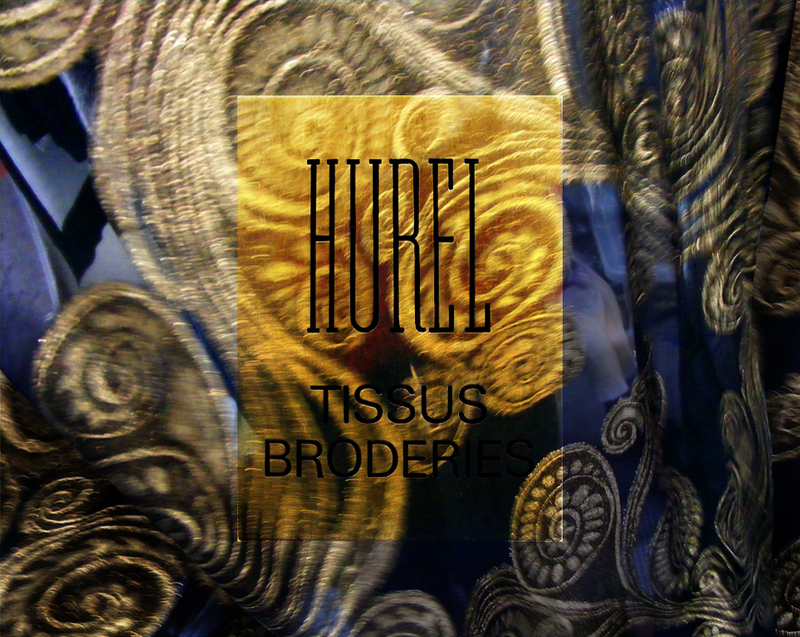 All Hurel fabrics are entirely made in France, for both ready-to-wear and Haute Couture. 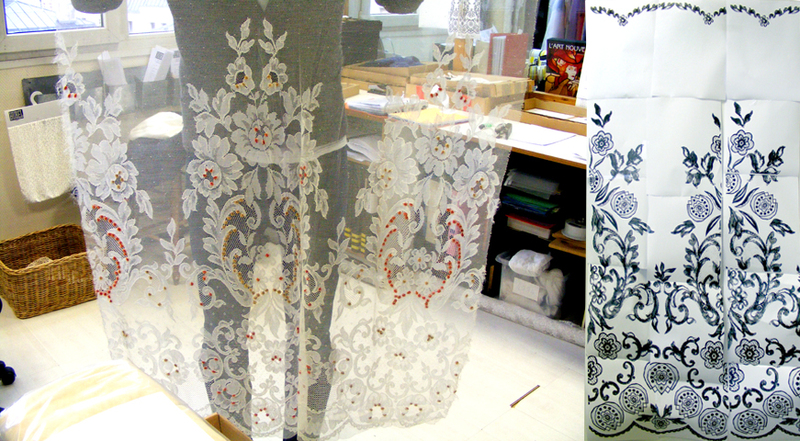 Its embroidery is done at the company’s in-house-atelier, at Hurel’s Paris Head Quarters. Martin Hurel, Director of embroidery, he over sees the direction and development of embroidery designs, and works mostly with haute couture houses to create unique, modern, embroideries, using traditional embroidery techniques. Baptiste de Bermingham, son of Madame Hurel, is director of communications and sales, he is responsible in the distribution of Hurel fabrics, and works with fashion companies worldwide. In its history, Maison Hurel has managed to create fabrics and embroideries for some stellar creations from some legendary designers. Valentino’s “Fiesta” dress created in 1959, features red roses, draped in layers of silk tulle over a tulle bustier, all fabrics from Hurel. This quality of tulle has continued to be produced by Hurel and used by Maison Valentino for their Haute Couture collections. First Lady Jacqueline Kennedy wore one of the most famous dresses made for her to a dinner at Versailles, an ivory Ziberline gown, designed by Hubert de Givenchy in 1961 and embroidered by hand, in a bouquet of flowers, by Maison Hurel. Mrs. Kennedy wore the dress to the dinner in France, making a grand entrance in her unforgettable Haute Couture creation. 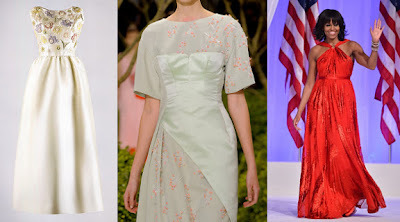 Most rec ently, Hurel created the scarlet red, bur n out silk velvet fabric, used to create the Jason Wu’s Gown, the first lady wore to President Obama’s Second Inaugural Ball. Their fabric innovations have been revered throughout time, as they continue to grow and discover new materials and reestablish old world techniques. Left: FirstLady Jacqueline Kennedy Givenchy gown, Cica 1960's. Embroidery by Hurel. Photo by Metropolitan Museum of Art. Center: Dior Haute Couture Spring 2013. Embroidery from Hurel. Photo by Stylebistro.com. At our visit to Masion Hurel, we were privileged to see the house in its entirety along with the archives. We also visited the atelier, where the embroideries are made, mostly for haute couture. The in-house artists are responsible for the surface design of all the fabrics, either exclusively designed for one designer, or designed to be sold for broader distributions. Ninety -five percent of the fabrics developed at Hurel, are mostly used by luxury, ready-to-wear houses, while the rest, and embroideries are reserved especially for the haute couture house. Those fabrics designed for the haute couture, are usually designer for a certain designer, reserve a one of a kind aesthetic, and require more labor to manufacture. The ready-to-wear fabrics have evolved to use modern, more efficient techniques, to create a larger yield, without reducing quality. For example, at Hurel, looms that have been reserved for jacquard fabrics, have been used to create, 3 dimensional, textured velvets, in rayon and lurex. Using the machines in new ways, has allowed Maison Hurel to create very lavished, new, luxury textiles that make fashion new, and inspire s designers to create new ideas. These ideas and concepts do come with the challenge of finding looms, or older looms, and the people that know how to use the equipment. Hurel has been adopting old, antiquated looms, in hopes of using them to re-develop old textiles, or use them to create new textiles. Some of these looms have not been in use since WWII, and require a skilled hand to manipulate and to create certain textiles. One fabrics is Lace, a product in which Hurel specializes. Other specialized fabrics include; jacquards, velvets, taffeta, organza, tulle, and novelty fabrics. Lace with large repeats and designs have been in demand by designers in recent times, for bolder and richer effects. Old lace looms can create larger patterns, or repeats , but there are no artisans left who know how to use the looms or are willing to do the hand work, which pays very little, when much more money can be made doing a simpler job in other industries. When it comes to lace, even in the luxury sector, companies have turned to factories that imitate the hand work that used to be created by specialized artisans, using computer generated machines, and mass production. Lace with a larger pattern usually comes from the Lyon region of France, and has become more desirable for the bold patterns and larger repeats, but are often reserved for haute couture due to the high price to in manufacturing and its limited sources. Some lace patterns from the early 20th century, could not be re-made, since the technique has been lost over the years, so Hurel has been able to recreate these special laces using a modern embroidery technique, that gives the lace large, rich, 1 meter repeat. These textiles require special care, attention, and skill, which has become spares and hard to achieve. 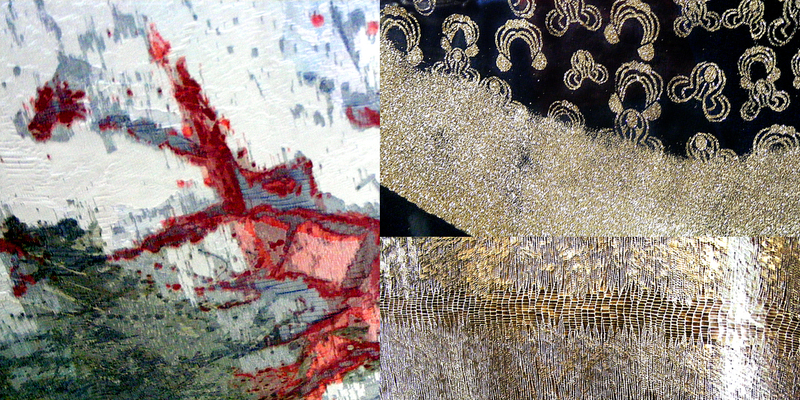 The lost techniques of the golden age Meiter d’ art, makes it harder to produce these textiles. Losing touch with the heritage of making haute couture textiles has forced this great House to creatively re-invent itself. Maison Hurel is actively working on retaining a sense of heritage within its company. Left: Flocked Tulle. Right: Lurex iridescent velvet. Left: Guipure lace. Center: Sun-ray Pleated velvet, for haute couture. Right: Raised textured fabric, using modern techniques to produce. Left: Apstract printed gazar. Top-Right: Hand glued glitter on chiffon for Saint Laurent. Button-Right: Lurex velvet, embossed to look like lizard skin. Vintage print screens, on display at Hurel's studio. Hurel Design and Embroidery Ateliers. Haute Couture Lace, in a large repeat, developed by Maison Hurel. The 3rd floor atelier is exclusively dedicated to the fine art of embroidery. This studio is respected for the skillful hands, and techniques used in haute couture embellishments and ornamentation. Usually reserved for the Haute Couture houses, the embroidery atelier at Hurel, is one of the last houses that creates fine embroideries for haute couture. With clients such as Dior Haute Couture, Valentino Couture, Christophe Josse, and Gucci’s made-to-measure line, Premiere, they follow a strict standard of quality, and unique design. All embroideries are done in house and all designs are either custom designed by the client or done by the Hurel design team. With an average of 160 hours for each embroidery, this department works mostly with haute couture houses, and produces its creations with the tambour hook. The tambour hook, is an old, traditional, French tool used to attached ornamentation to fabric with thread. Rarely is the hand sewing needle used, except for large beads, crystals, fabric appliqués, or feather work. Each embroidered design is either done by an in-house artist, or custom designed in collaboration with a designer. Maison Hurel, creates seasonal designs, which are presented to houses, a season prior, after a design has been purchased the design, the embroidery motif is reserved only for that house that has acquired it. Maison Hurel never reproduces one design from one house to another, and ensures the uniqueness of its design. Quality Controll: Hurel ensures all of their clients receive the finest quality. Maison Hurel is a last of its kind in specializing in an art form that seems to be forgotten and not properly brought into the light. Hurel’s smart approach to retaining heritage and tradition, with keeping in mind the demands of the modern world, has proven that there is still a passion for creating the essentials goods for quality clothing, and that there are still those who live to create beautiful works of art by hand. It is our duty to support artisans who put their love in soul into what they do the best! The archives at Maison Hurel, every fabric created by the house. Hurel's novelty laces, tulles, velvets, and flocked chiffons. Master the Art of Style brings news, articles, and reports on the best the fashion world has to offer. Wheather it is on the lastest runway shows,the best places to shop, we only offer the best from New York, London,Paris; from west to east coasts. As Luxury experts we share the most unique and precious fashions in the world, from haute couture,to celebrated designers,and small independent ateliers. Master the Art of Style is an independent Blog, and is NOT associated with any other online publications, e-commerce site, or any other online affiliates. All writing is exclusive property of Master the Art of Style and its writers. David Pedroza has been designing and making haute couture garments under his own name, since 1998, for private clients. His love and passion for couture inspired him to write about the craft he loves, Haute Couture, thus launching Master the Art of Style in 2009. As an expert in Haute Couture and Luxury fashion, David has been able to write about some of the worlds most unique and special couture houses, ateliers and individuals. David Pedroza still produces haute couture under his name in New York City.